In the beginning, before you master the techniques I am about to share with you, it will take a bit more time. But over the course of a week, you will find that time spent on emails will go down, and so will your anxiety. Step one is simple, set aside time in your day to dedicate to your inbox. This can vary depending on the average number of emails you get a day, and the likelihood of those emails being time sensitive. You choose how many times a day you schedule inbox time - setting a cadence that best suits your needs. Once you have a dedicated time set aside for your email, you need to organize that email. I like to start with labels and folders. When creating a label, I recommend you create a “Primary” label. This will encompass many sub-labels. For example, your label could be named “Client A”, and all the subsequent labels you create that nest under that label will break down the primary types of tasks/emails from that client. If you work for a singular client, you could also sort this by project and tasks within that project. These will then be available on your sidebar when in your inbox for ease of access when your boss “MUST” find something right away. Adding an ! before your label name will move that label to the top of the list. I love to use this for labels such as !To-Do, !Waiting-On and !Completed. I use these to let myself know if the email that is coming in is something actionable for me, if I am waiting on someone else to complete the actionable, or if the task is complete and ready to be sorted (no more wondering if you finished or not!). 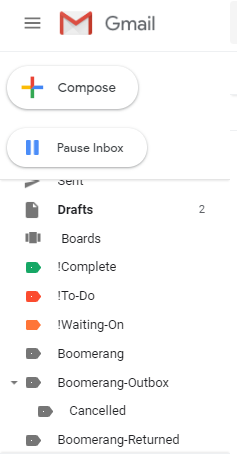 I also coordinate my !To-Do label as red, !Waiting-On as Orange and !Complete as green. This is such a great way to use a color association you already know to help you get a visual feel for what is waiting in your inbox. You can color code your labels - this is great when working with multiple clients, departments, or if you just generally enjoy colors! Personally, I select one color per client and apply a gradient of that color to all the subsequent labels nested underneath. This allows me to know every purple labeled email belongs to Client B, and any variant in that purple indicates the type of work for that client. Once you have created labels and color-coded them, you can set up filters to allow those emails to get that label automatically as they appear in your inbox. It's quick and easy! In the drop-down menu in your Gmail (the search bar) press the downward facing arrow, simply input the information needed (not everything is required, just an email or keyword or phrase will do the trick), create the filter, and select it to be applied the appropriate label when it goes in your inbox. (This is a great place to select archive if you don't actually need to read the email, but need to keep it - this will cut down on unnecessary emails in your inbox). You can apply this filter to existing emails with the same information, too. This comes in handy when you are working through a backlog of emails, wanting to get to inbox zero. Using these tactics will easily allow you to not only organize your day but also allow you to quickly scan your inbox and know what sort of tasks you have waiting for you totally eliminates the dread of opening an email and having no idea what it will hold.